Before I get to the nitty-gritty, here is a short clarification regarding the regular — passive — loudspeakers’ deviation from active models. An active speaker differs from passive speakers in that the crossover has been removed and each driver — tweeter, midrange and woofer — has a pair of dedicated terminals to which the power amplifiers are connected. To appropriately manage the frequencies for each driver, the audio signal is controlled by an electronic crossover placed between the preamplifier and the power amplifiers, rather than the passive crossover version, which is typically built into the loudspeaker. The active speaker arrangement requires three separate amplifiers whereas a passive system only requires one amplifier. There are numerous advantages using an electronic crossover beginning with the ability to control crossover points, slopes and gain at low-level signal levels whereas passive designs are operating at what is referred to as high-level signal levels. This allows far more accurate control at the volume levels for each driver. With the active crossover — the BAX-1 — it is possible to adjust the performance of each driver independently, compared to passive designs which forces adjustment to be made in tandem and is nowhere near as accurate. The flexibility and accuracy of an active crossover like the BAX-1 can not be underestimated. The BAX-1 is the culmination of extensive testing in an anechoic chamber and is designed for each specific Model T speaker. It can not be used with other brands, although it can be made for them, if money is no object. You should know that the BAX- 1 is a digitally controlled crossover, customized for use with all Bryston amplifiers but not necessarily with a Bryston preamp. I was going to use my in-house Weytech Labs Ruby preamp, but wound up using the Bryston BP17 as all interconnects provided for this evaluation were the balanced sort and my preamp offers only single-ended connectivity. However, all components also provide single-ended (RCA) connectivity. I wound up with eight balanced interconnects altogether — two from preamp to crossover, then six from crossover to power amplifiers. All this was not an easy installation — actually too much work for a retired reviewer, which is why I had help from Bryston’s James Tanner and Mark Jones (Audio) who is Ontario’s only active system retailer and well qualified since he already had installed a couple of systems. Back to the set-up. 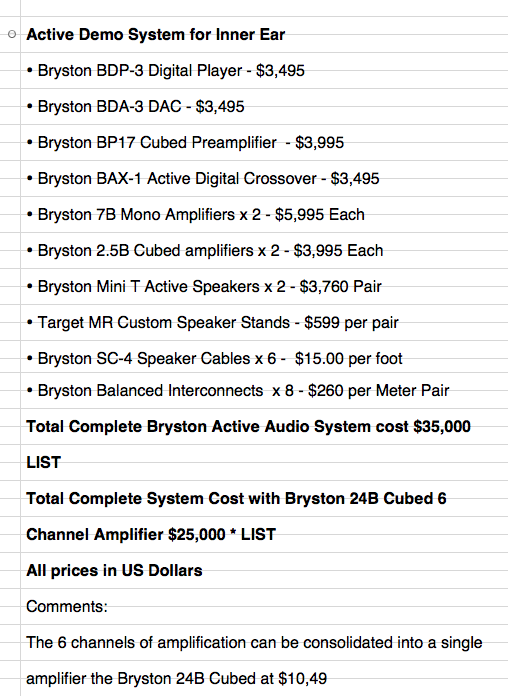 In addition to a lot of cables, the system components include Bryston’s BP17 preamplifier, BAX-1 electronic crossover, two 7B Cubed mono amplifiers, two 2.5B Cubed stereo amplifiers, two Mini T active loudspeakers and two custom Target speaker stands. Add to that, what I had in-house as source components — the Bryston BDP-3 digital player and the BDA-3 DAC, and the system winds up with ten components. Watts, power and energy galore. I used the in-house 7Bs for the bass driver— that’s over 900 watts per channel, and the two 2.5 stereo amps — 180 watts per channel to drive the midrange and tweeters — that is altogether about 2,520 watts (into a 4 ohm load). Too much power, you say? NAY, there is never too much although this system could have been driven with the use of the dedicated single six-channel amplifier, the Bryston 24B Cubed — save quite a few bucks too. The active loudspeaker model is basically the same design as the passive Mini Ts I have reviewed, except there isn’t the internal crossover and, instead feature three pairs of external binding posts for each driver on the enclosure’s rear. The original specifications list is — Frequency Response: 40Hz to 22 Khz (+/- 3dB); Impedance: 4 Ohms (nominal); Sensitivity: 88 dB SPL @ 1 meter with 1 watt (anechoic, with the active version at about 92 dB more efficient); Maximum SPL: 100 dB SPL @ 1 meter; Recommended Power: 10 watts to 200 watts RMS; Tweeter: Single 1.0"; Midrange: Single 5.5"; Mid-Woofer: Single 8.0"; Crossover: 160 Hz & 2.3kHz. Each cabinet measures 22.5” high x 10.5” wide x 10.0” deep (572mm H x 267mm W x 255mm D) and weighs 39 Ibs (17.7 kg) each. Optional finishes in addition to black ash include natural cherry (vinyl), Boston cherry (vinyl) and hardwood veneer. 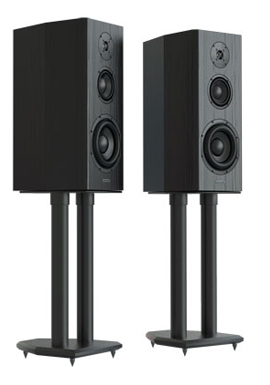 (For more information, go to www.bryston.com) The active speakers have the same crossover points, but now handled by the BAX-I. I am not 100% sure, but I believe that the speaker cabinets are somewhat more rigid, or less resonance prone thanks to the added metal rear terminals. A little Mozart, a lot of Beethoven, some Vivaldi, some Bach, some Stravinsky and others, made up my classical music listening material. My favourite blues included Stevie Ray, Buddy Guy, Etta James and for the jazz, I listened to music by Miles, Brubeck, Fitzgerald, Joey De Francesco and, of course, some of the best from Jimmy Smith — the trio and the larger group arrangements beginning with the Chicken Shack. Oh, and I did play back some Pink Floyd’s Dark Side and Zeppelin’s Stairway To Heaven just to hear what a modern system like this can do to the best of the seventies rock. When I began listening to my classical selections, my first impression was surprise of the system’s handling of highs produced by violins. The strings sounded wonderfully effortless, smooth and continuous over the instruments frequency reach. The system captured the instruments’ melodious souls — the wooden body and slight sheen of the strings — that without any of the sizzle so noticeable on even fairly good recordings. The frequencies below the violins’ highs can be considered the upper midrange, and this segment also has no audible drawbacks such as stridency or sibilance in male or female voices. In fact, the entire midrange from about 200Hz to 1500Hz came across very naturally, still handling great detail, but without imposing it onto the listener — me. The lower midrange — from about 150Hz to 350Hz is often poorly reproduced by many passive loudspeakers and makes it difficult to identify and distinguish, say, the sound of a cello from that of a viola or even bass. With this system, however, there wasn’t any doubt as it faithfully reproduced what I perceived as an accurate representation of those instruments’ timbre. My jazz auditioning was very fascinating inasmuch as I have been listening to these recordings for years and therefore was intimately familiar with the music and the recording/production quality. There, on some old Jimmy Smith music recorded by Rudy Gelder back in the fifties, it became obvious that the Hammond B3 was recorded and played through the customary Leslie speaker — and that is, in fact, the sound of the Leslie and not — as in later, more modern recordings — directly connected to the mixing console. Big difference here — big difference vividly rendered by the system. So let’s talk about the system’s ability to reproduce the bottom end. Deep musical material reproduced by bass — contra and electric — and from pipe and Hammond B3 organs was not only good and authoritative, but also made me feel that the system could have produced even deeper, more floor-shaking lows. My listening environment is set up so that I am within about 5dB flat across the entire frequency range, although I believe that there is a slight bump at 35Hz, which might add a touch more excitable force from some of the recordings. However, I found it quite surprising for the system to achieve astounding bass detail making it easy to hear the difference of, say a cello and double bass. Bass response like this may seem a bit too good to be true and may not be perceptible on most commercial recordings when the mastering engineers roll off the low end at 40 or 50 Hz, but there are good recordings that will let you hear into this. I was, still am, amazed that those speakers can reach at least an octave lower than the passive model — and it’s done with great resolution and refinement. I’d like to point out that playing back a typical recording on this system reveals every nuance of what quality it is but also shows whatever imperfections may have transpired in the mastering. In other words, the sonic character of a recording can not be corrected, so it is recommended to play back the best music production you can find. I have a number of recordings with sizzle, bellowing mid-bass, booming bass and pinched or diminished midrange, which I didn’t enjoy listening to. Yet, other fine recordings I have known for years, had me surprised when I heard subtle details, I had not known existed. The system has another quality: it accomplishes absolutely astounding dynamic range from music such as Beethoven’s Fifth which has extensive dynamics. Such large-scale works also incorporates amazing midrange energy (presence) and many speakers, including the regular Model Mini Ts, have a tendency to be a bit lacking. Comparisons aside, I would describe the sound of the system on large-scale orchestral music as breathtaking. I can think of only a handful of systems I have auditioned or reviewed— all in the mega-buck range — that will match or come close. The Model Mini Ts are not what could be called a "polite" sounding speaker, they are; however, better able to convey the actual character/spirit of the music, sounding full-bodied and charming or rough and aggressive depending on the music itself. I did re-adjust the setting of the BAX-1, but soon found that its factory setting was right on in my listening environment. Although the Active model Mini Ts are referred to in the heading, this evaluation is for the entire system and includes every component used to drive it. Thus, It is best not to focus on one or two components, but rather on the performance of the whole system combination. Nonetheless, it is about the sound reproduction of the loudspeakers and it is essential to understand that the Active Mini Ts are — or can be — at their best, thanks to the back-up components. Their overall sound tends to be very revealing, as is appropriate for a system that will almost certainly be used in a listening room, where listener will be about ten feet or more in front of the loud speakers. The speakers boast a nearly perfect neutral sonic perspective and this, along with the aforementioned incredible revealing attribute serves to place a well recorded small assemble slightly in front of the system, thus producing a striking ”live” illusion, but without any of the hardness and in-your-face elements, often experienced in systems that project the sound forward. I found that really good recordings of small jazz trios and quartets sound close and intimate — that’s just right — while large orchestral works have the perspective very similar to the size and distance of the stage and performers in a concert hall. I have lived with this system for over a month, played it almost every day for a few hours and listened to a great many recordings that I had forgotten or ignored for some time. However, the Bryston system encouraged me to go beyond my usual listening material, because it is a fine example of audio synergy arranged to work so that each component complements the other. After hours of auditioning and deliberation I found that there is little, if any, way to improve the performance. But this is audio — a hobby which dares/challenges its enthusiasts to continually upgrade, refine or simply update. The question has to be — is this possible with the Bryston system? And the answer to this can not be straightforward, because the system components can not be modified to suit a particular, individual predilection. It doesn’t need modifications in my opinion. Nevertheless, I did test the system with some upscale cables and did indeed find a way to not modify the sound, but enhance it instead. The rather expensive addition didn’t change the system’s sonic distinction but did give me the impression of it being magnified/intensified. Another high-end rearrangement could be the use of your favourite preamplifier, but I can see no shortcomings using the BP-17 and do not recommend changing it. However, philes will be philes and if you must change things around, be prepared to spend over $20k for cables as a starter. If you wish to simplify the system, and save a few dollars in the process, you could use Bryston’s six-channel amplifier made for all active systems — the 24B Cubed. It’s priced at $10,490 and saves over $9k. This system may not offer as much power and dynamic presence, but will still have a virtually identical sound. Anything to add? Yes, use a phono stage and a TT and you are all set for analogue and digital playback, sit back and enjoy luxury audio for the price of high-end.